Holy flying space churches, admiral! I've always been a bigger fan of the ground troops than Warhammer 40,000's spacefaring corps, but my word Tindalos Interactive are doing justice to the Battlefleet Gothic fantasy. 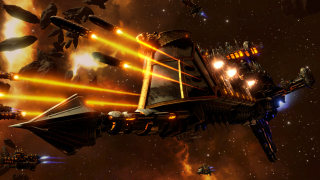 Today's video details the ships and abilities of the Imperium, one of four races alongside Eldar, Chaos and Ork fleets, and I'll be damned if I've seen a more convincing galactic castle than in Battlefleet Gothic: Armada. It's the presence of each ship and the weight of their interactions that has the bulk of my interest, however. A valid strategy for the heavily armoured Imperium fleet is simply to ram the enemy and watch them recoil—the course of both ships is altered by the impact. Meanwhile, micro-warp jumps enable the sort of battlefield dynamism you wouldn't expect from ponderous dreadnoughts. Fatshark captured the Warhammer aesthetic perfectly in The End Times: Vermintide in October, setting the benchmark for this year's random helping of Games Workshop products. If it plays anything like it looks, though, Armada could outgun it come 2016.